A few weeks ago we came into work to find a traveler camped out in our parking lot. Jay Williams was his name and he had been traveling since June 4, 2017 with a goal of hitting 49 of the 50 states. He joked with only Hawaii not being on his list due to the fact he is not a strong swimmer, but realistically it would cost him an arm and a leg to ride over on a boat. Jay is a Florida native, born and raised, where his local dealer Ft Myers had a sendoff for him when he left back in June. Not only is it pretty amazing what Jay is doing, 49 states on two wheels, but what is even more impressive, not only is he covering all of that ground on two wheels but those two wheels are on a 1999 Sportster 1200! 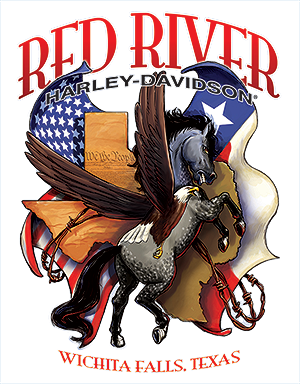 Thus far Jay has traveled to 36 states covering 12,000 miles...all on his Sporty. To add to the impressiveness of this trip, Jay is completely deaf. He carries around a notebook and a pencil to communicate with everyone. As we were writing back and forth, he told me that I am living his dream, as my family owns a Harley-Davidson dealership. We laughed, as I told him well that goes right back his way! It is my dream to cross the U.S. on my 1200 Sporty! I bought us a couple of hamburgers from our RRHD cook-out and we sat down and wrote our conversation. He was absolutely a breath of fresh air as he told me all about his travels. 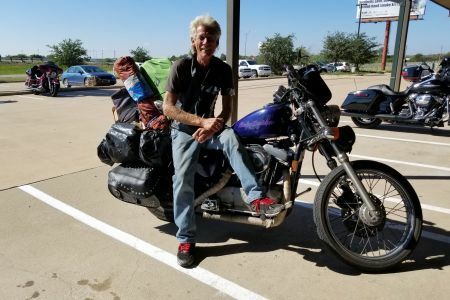 He never stays in hotels, carries everything he needs on his bike, and loves to stop at every Harley shop along the way toward adventure as he makes his way across the U.S.
Jay, it was a pleasure to meet you! Hope all the best for you and SAFE TRAVELS on the road toward finding your freedom! !